SINGAPORE--(Marketwired - Nov 10, 2013) - Tiger Street Football 2013 concluded last night after an exhilarating Grand Finals at 23/9 Park in Ho Chi Minh City, Vietnam, after igniting the streets and thrilling fans across seven Asian megacities since March this year. Local team Dat Vinh Tien (DVT) bagged the coveted title of Tiger Street Football Grand Champions and the top prize of USD30,000 to the deafening cheers of the crowd after a goal-packed finals match. They emerged the winner out of the National Champions from tournament legs in Cambodia, Australia, Mongolia, Malaysia, China and Singapore, two International teams from Brazil and England, and four teams in Vietnam from Day 1 of the Grand Final. These four Vietnam teams, Tam Hoan Chau, Thuan Phung Hung, DVT and Quang Dinh, were the top local teams from 1,000 teams which entered qualifiers held across six cities. South Canton from China put up a good showing throughout the finals, and claimed their hard earned runner up position after an intense battle with the DVT, to achieve a final scoreline of 8-0. 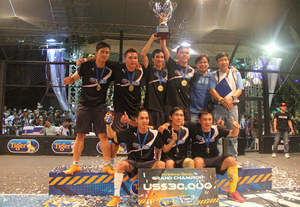 Previous 2011 and 2012 tournament champions Floripa Street Football from Brazil took the second runner up position after a 3-2 close fight with the winning local team from Day 1, Tam Hoan Chau. These teams took home USD10,000 and USD5,000 respectively. "The dynamic game of street football requires not only speed and skill, but also creativity, sharp instincts, and quick thinking to succeed -- attributes that truly resonate with Tiger Beer. We are delighted to see consumers enjoying both the game and Tiger Beer at each of our Tiger Street Football events. Since the first tournament in 2011, we have seen an increasing love for the sport in Asia which is why this year Tiger Beer expanded the tournament to include three more cities to share this amazing experience with more teams and fans. We look forward to engaging fans with an even bigger and better Tiger Street Football campaign in 2014," said Mr Kenny Tang, Regional Digital & Events Manager for Tiger Beer. Graced by the official Tournament Ambassador and Italian football legend, Fabio Cannavaro, the epic two-day Grand Finals saw players from around the world showing off their finest street football skills and thrilling the crowd with electrifying high-speed matches. In an oval, caged pitch, each five-a-side game involved two 6-minute halves and a 2-minute half-time break while thousands of spectators and fans watched from the edge of their seats. Off the pitch, Tiger continued to delight fans as Ho Chi Minh City's 23/9 Park was transformed into a vibrant carnival filled with exciting football action, refreshing Tiger Beer and lots of fun, featuring an entertainment line-up of street style acts and adrenaline pumping performances by popular local singers. Fans were also treated to energetic dance segments and appearances by the beautiful Tiger Cage Girls. Amidst all the action, one of the star attractions of the Grand Finals and also at all of the tournament legs was indeed the many appearances by Tournament Ambassador Fabio Cannavaro. Huge crowds in each of the cities watched in awe as one of football's greatest defenders showed off his skills during exhibition matches with the public and members of the media, while some lucky fans got the chance to interact up close with him during activities like autograph signing sessions, foosball games and more. Commenting on the potential of Asian football, Official Ambassador and former FIFA World Player of the Year, Fabio Cannavaro said, "It has been an exceptional experience so far. In the last eight months I have seen some really talented and nimble displays of street football and got to meet thousands of passionate young footballers from around the region. Street football is something I grew up with and it is what got me to where I am today, so I am really happy to be part of Tiger Street Football to grow the passion for this exciting, action-packed sport and build a vibrant street football culture in Asia." Khong Dinh Hung, Team Captain of DVT said: "We are so happy and excited that we won the tournament! This means a lot to us as we took fourth place last year, and being crowned the Tiger Street Football Grand Champions makes us feel like all our hard work has paid off. Not only did we get to represent our country, but we also got the chance to get up-close-and-personal with our hero Fabio Cannavaro, and learn from some of the best street football players from all over the world as well. This has really been an incredible and inspiring experience for us, and we will most certainly take part again next year!" Tiger Street Football is a regional street football tournament organised in partnership with FOX Sports and took place in seven major cities in Asia from March to November 2013. The tournament brought together street footballers from Germany, Holland, England, Spain, Sweden, Argentina and Italy, together with over 10,000 players (1,500 teams) from 22 cities across seven host countries this year.